On Sunday evening, November 19, 2017, I received a last second meeting request from my boss. He apologized for the late notice asking that I clear my calendar for the next day and to meet him at the DFW Grand Hyatt Hotel at 10AM. In an instant, I understand that I had just been fired. My first two years with Workrite had been good and my business had generally ramped up. I had a strong relationship with my boss and he had always been a great supporter of me. My third year however had been slow and I knew my position was in jeopardy after a less than positive annual review just a few weeks prior to my dismissal. The meeting was short and sweet and I was close to tears as my boss had become like a father figure to me. After turning over my credit card, cell phone, and laptop, we parted ways. He promised to be a reference as needed and we said our goodbyes. As I drove home, my thoughts raced as to what would be my next move. With Thanksgiving only days away, I made the decision to take the week to go and spend time with my family. After the holiday break, I would then tackle the decision as to what would be the next chapter of my life. Having spent 39 months working as a manufacturer rep for Workrite Ergonomics, my first choice was to pursue a reps position with another manufacturer. Unfortunately while the DFW market is huge, rep jobs are hard to come by. For the positive, I had my first connection and interview the week following Thanksgiving with one of the top manufacturers in the industry. Ultimately, the position did not pan out. That was one down. Throughout my journey, I committed to maintaining my normal daily schedule of getting up at the same time, heading to the gym after my bible study, and being locked and loaded in front of my lap top by 8AM. I figured if I wasn’t working for someone else, I could spend the same amount of time looking for a new job. Between Thanksgiving and April, I interviewed with numerous companies both in and outside of the furniture industry. Never in my wildest dreams would I have thought it would be possible to go without work for five months…almost to the day. It wasn’t for a lack of effort. One great example is a company where the time between the first and second interview was a whole month. I was disqualified shortly after the second interview and lost 4 weeks from that one opportunity. This same scenario repeated several times leaving me less and less hopeful. Fortunately, I had been frugal with my savings and had a nice cushion to weather the transition. While I was fine financially, it still left me feeling rather dejected every time I had to shift funds from savings to my check book. 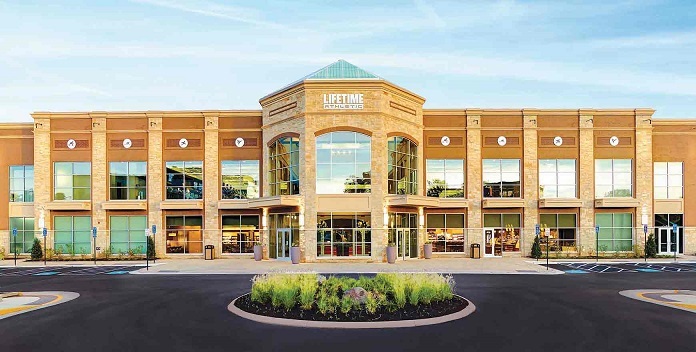 The happy ending to the story is that I accepted a new position with Life Time Fitness as a Fitness Professional on April 17th. The rest of this post will share the thoughts and considerations that took me from pursuing another position in sales to following my true passion which is to serve people through fitness. Most people have heard some version of the old saying that if you do what you love the money will follow. That general idea has “haunted” me for years because I’ve spent the bulk of my working life questioning whether I was doing the right thing given my skills and passions. Outside of my commitment to my faith and family, my dedication to fitness has been the most dominant passion in my life. I had worked as a fitness professional for two brief periods where both times I ultimately left each job for all the wrong reasons. An injury took me out the first time and a failed marriage engagement the second. Under those circumstances, I was never been able to get it out of my mind that fitness was where I was truly supposed to be. Author, speaker, and uber success guru Brian Tracy poses the question in his book “21 Success Secrets of $elf-Made Millionaire$“, “If you won $1,000,000 tax-free today, would you continue in your current career?” The point is obviously about passion and I’ve asked myself that question countless times over the past twenty years. With only two exceptions, my answer would always be no. Those exceptions would have been during my two short stints working as a fitness professional. To stay on the passion theme, leadership expert, John Maxwell says to find something you love enough to do for free, and then get good enough that people pay you “well” for doing it. It’s the same idea as the Confucius quote above. John also shared in his book, “Leadership Gold”, about a study of 1,500 business school graduates whose careers were tracked from 1960 to 1980. The first group (83%) made the decision to make their money first and then spend the rest of their life enjoying themselves. The second group (17%) pursued their passions trusting that their finances would ultimately work out. 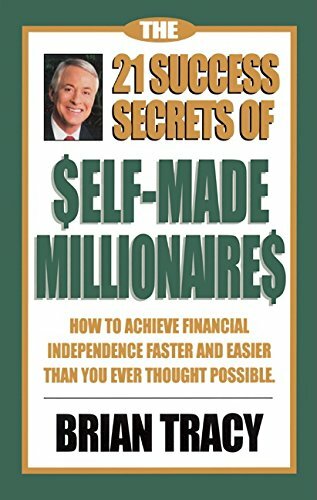 After twenty years, it was determined that from the original 1,500, 101 became millionaires. Oddly enough, 100 of those came from the passion first group and only 1 from the money first group. There’s definitely a lesson there to be learned. Author and speaker Jim Collins teaches on pursuing your passions with The Hedgehog Concept using three circles all overlapping in the middle. 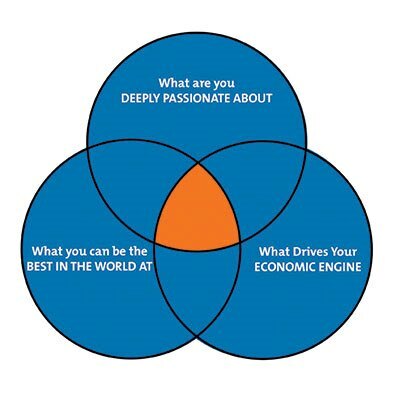 The circles represent your passions, skills, and ability to make $. The middle or sweet spot is where you really want to be and unfortunately most people do not live their work lives with this type of alignment. My last job touched on elements of my passion for serving through fitness, but it was far from providing me with the vehicle that the fitness industry does for truly changing lives. Now for the first time ever, I have the skills, passion, and one of the best companies in the fitness industry to harness and move into this next season of my life. This actually gives me much-needed piece of mind because of the last two influences. 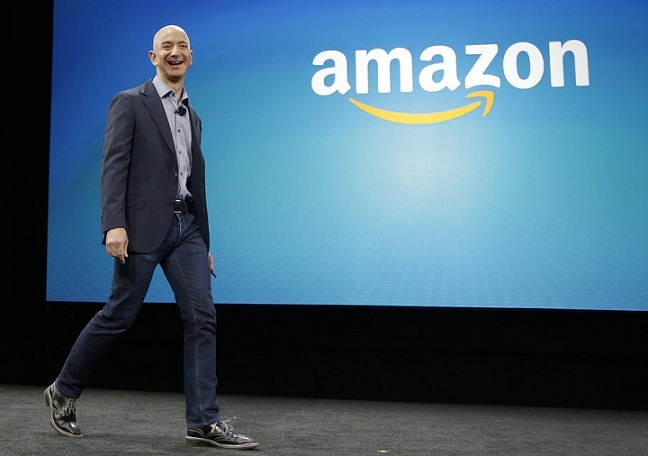 While most people are familiar with Amazon founder Jeff Bezos, they may not know the story behind the story. According to Wikipedia, Jeff graduated from Princeton University in 1986 with degrees in electrical engineering and computer science. He worked on Wall Street in a variety of related fields from 1986 to early 1994. In late 1994, Jeff founded Amazon and the rest they say is history. The take home point for me is the thought process Jeff used in determining to leave his cushy Wall Street career to found an online bookstore. After sharing with his boss his plans for Amazon, his boss replied back that he thought it was actually a good idea. He thought however that it would be a better idea for a guy who didn’t already have a great career. After careful consideration including 100% support from his wife, Jeff broke the news to his boss that he would be leaving to start his “little” online book store. He said the biggest driver was the fear of regret. He said he didn’t want to stay in finance and look back many years later with thoughts of regret for never having given his Amazon concept a shot. He could always get another job in finance, but didn’t want to live with any regrets for actions not taken. My last motivation comes from my all time favorite book, The Bible. In Matthew 25:14-30, Jesus teaches on the Parable of the Talents. For those not familiar, a wealthy master leaves his home to go on a journey. He gives three of his servants, 5, 2, and 1 talent respectively. The first two servants took what they were entrusted with and doubled their master’s original investment. The third servant took his talent and buried it in the ground for fear of loss should he try to go out and increase the investment. God has given me gifts and abilities to serve people through fitness and I have felt for quite some time like the third servant. It’s not that I haven’t helped people as an extension of my daily life both in and out of the gym, but to serve on a full-time basis is a different story. So many times I’ve gone to the Lord in prayer asking where and how to best use the gifts He’s given me. I believe God answers all prayers, however, in some cases, we have to be willing to step out on faith and trust in Him before he answers our prayers and blesses our efforts. I first contemplated a career in fitness back in 2004. Now after 14 years of mental gymnastics, I’m finally where I should have been all along. If there’s any advice I might offer, it’s this. Life is not a dress rehearsal. This is our one shot so make the best of it. You don’t want to look back at the end of your life and have regrets for risks not taken. It really is never too late to make a change. 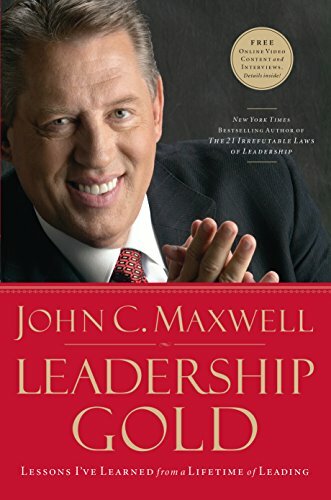 Leadership expert John Maxwell wrote his first book in his 40’s. Now at 71, he written in excess of 100 books selling many millions of copies. I can only guess as John struggled to scratch out his first book called “Think on These Things“, that he would never have imagined selling millions of books in the years to come. The key point is that he had to take the first step. It is truly amazing how small steps, taken consistently, will compound over time to produce amazing results. Never negotiate time as a price to achieve your dreams. The time is going to pass regardless. Only you can determine whether you make your dreams a reality or allow them to remain a fantasy. Throughout my time in the “wilderness” one friend above all others stood by my side and encouraged me through my trial on a daily basis. Joe was my voice of reason as I interviewed with each company. Throughout the process, he knew fitness was where I should be and thankfully never let me forget about it. He played a huge role in giving me the courage to pursue my true passion. I can never begin to repay my friend and now mentor, Joe Pici. 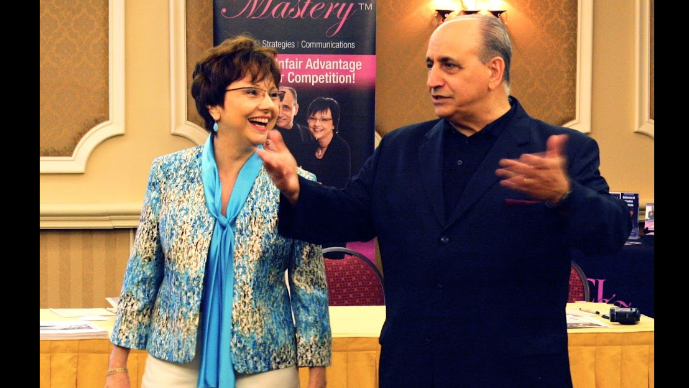 Joe & Dawn are master sales trainers based in the Orlando, FL area and work with companies around the country helping them take their business to the next level. This entry was posted in attitude, career change, Christian, Dawn Pici, Faith, Follower of Christ, Health & Fitness, Joe Pici, John Maxwell, learning from mistakes, life path, living your dream, personal development, spiritual gifts, success, the power of associations, Uncategorized, weight training and tagged #diet #health #fitness #wellness, Christian, Follower of Christ, health & fitness, John Maxwell, learning from mistakes, life path, personal development, seeking wisdom. Bookmark the permalink.